2017 is a month in now and people are starting to look forward to happier times, mainly in their Bathrooms. 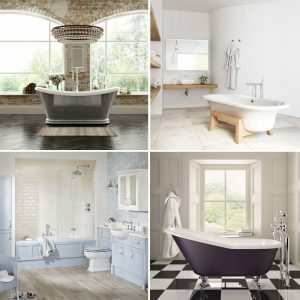 So it’s the perfect time for Pipescene’s predictions of the new Bathroom trends for the coming year. Due to the BBC’s Downton Abbey, many are bringing the Victorian era back into their bathrooms. 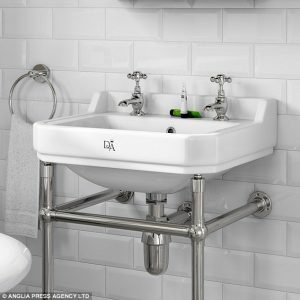 Lavish monogrammed clean white basins and simplistic steel towel rails. It reminds us of simpler times and looks simple enough to do. Many 2017 Bathrooms are already feeling the minimalist back to nature vibe. This year’s Bathrooms will be all about bare but warm wood flooring and touchable surfaces. The rugged appeal of stone carved baths and basins are strong but in reality, they can be very heavy. Feel free to run any ideas by us for guidance before fitting. Generally, it is all about the under-furnished bathroom and wooden floors are a must. Both for the touchable surface appeal but also as a great insulator of heat. A few floral displays or plants to get back to nature perhaps but certainly consider looking at blank white or light coloured curtains with no decoration. Think ‘no-frills’ surroundings because as usual less is more. 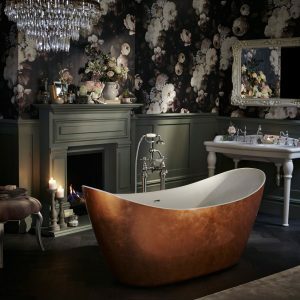 Again the old-fashioned style is back in with the legged bath raised from the floor ( Madonna has one). It does free up space around the bath but could perhaps be unusual for some. Make sure you have strong joints to hold you in good stead, literally. Traditionally raised bath legs are metal based but there are wooden options available. Any Victorian style may come with an urge to cover the place in Brass fittings, in an attempt to look ‘dated’. There some fine Brass metallic Baths around. We some have showcased some interesting use of Brass pipe fittings in our other blogs and posts but ‘taste’ is the key factor here. Don’t go nuts and splurge everything in Brass or your Bathroom might end up looking like a steampunk utility room from the studio set of Game of Thrones.